Compatible Windows10, windows8, Windows7, Windows XP, Vista, ME, 2000, Mac OS and Other OS.Fit for for PC Computer Laptop Gamers. Note: Please remove the foot pad protective film before use! Trouble shooting: no any function. 1) Please check to see if the batteries are installed correctly according to the mark for the positive and negative inside the battery compartment. 4) Restart the computer to try again. Advanced Energy-saving Chip. 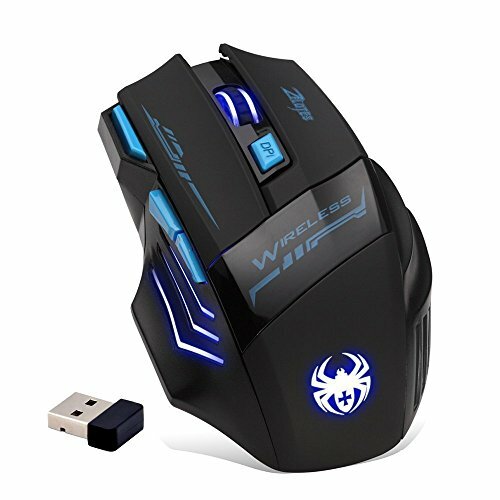 Multi-stage power saving mode, less power consumption,There is a button at the bottom of the mouse, three options: ON, OFF, light. Put it at light, the LED backlight will light up. Adopt 2.4GHz wireless technology,2.4GHz Wireless provides a powerful, reliable connection,increases working distance of up to 15m,The cursor performs stably. With strong adaptive surface ability, this wireless mouse works fine on many surfaces. Intelligent connectivity, Just plug the wireless receiver into your computer's USB port,and you're ready to go with no extra driver required. Compatible Windows10, windows8, Windows7, Windows XP, Vista, ME, 2000, Mac OS and Other OS.Fit for for PC Computer Laptop Gamers. If you have any questions about this product by Zelotes, contact us by completing and submitting the form below. If you are looking for a specif part number, please include it with your message.